Alien spawned one of the most iconic movie franchises ever to gestate in the hearts of movie fans. Alongside its sequels, there's books, games, and comics also dedicated to the series, so it's no wonder there's a huge mythology based on the universe. Oh, and a pretty detailed history surrounding the those productions and the world in which beleaguered survivor Ellen Ripley has inhabited for over thirty years. It shouldn't come as a shock that there's a ton of info out there on how it all came to be. Lucky for you, being the huge Alien geek that I am, I've narrowed down the best bits of knowledge, insider intel, and little-known factoids in this handy list so you can flaunt your knowledge. Read on, and celebrate Alien Day by schooling up on the coolest trivia facts surrounding this beloved sci-fi franchise. Shooting the moment when Kane, Lambert and Dallas explore LV-426 in Alien proved difficult for the actors bundled up in thick space suits and helmets. Budgetary restrictions prevented sufficient air from being siphoned into their gear, which when doubled with a technical breakage that leaked toxins led to everyone feeling generally rather woozy. The effect of being a bit out of it added an extra layer of authenticity to the crew's reaction setting down on the planetoid; yet it wasn't until Scott and cinematographer Derek Vanlint's children donned the suits to film in front of the space jockey - and one passed out - that health and safety measures were taken. The suits were redesigned to better enable air flow. A hidden Easter Egg on the Prometheus Blu-ray connects that film to Blade Runner. However, there's an even earlier tie-in between the Alien verse and Scott's 1982 film that makes a fleeting appearance in Alien 3. One of the film's matte artists Paul Lasaine included a nod to the Tyrell corp. If you squint as the camera sweeps across the wide, ruinous landscape of Fiorina's refineries, those shapes are a direct homage to the opening of Blade Runner. Look closer and you can make out the Tyrell Corporation building's pyramid structure. Weaver's slam dunk in Alien Resurrection? She got it in one. Director Jean-Pierre Jeunet was happy to create the moment digitally yet Weaver practiced for two weeks and sunk the ball on her sixth attempt. She described it as one of the greatest days of her life. Early on in development on Prometheus, Jon Spaihts penned a version of the script entitled Alien: Engineers. Certain elements made it to the screen - the med-pod scene being one - yet the overall story beats and creature elements are vastly different. Had his version remained, the expedition would have returned to the moon first visited in Alien, LV-426, where the presence of the black goo (officially referred to as a "mutagenic compound") was limited, and the focus stayed firmly honed on the origins of the iconic xenomorph. Holloway and Shaw's baby-making sesh would have ended with an homage to John Hurt's death: a chestburster was to emerge from his torso. And David the android, fascinated by the beast much like Ash, later traps Shaw in an egg chamber and teases a facehugger out. Saving the best for last, Spaihts included a scene wherein an Engineer is 'facehugged' by one of the xenomorphs and births the biggest alien in the series, dubbed an Ultramorph. The 2003 'director's cut' of Alien reinserted several scenes Scott had trimmed from his theatrical cut. One appears during Ripley's mad dash to the escape pod, Narcissus, as she stumbles across the alien nest discovering Dallas and Brett cocooned. Still clinging to life, Dallas begs Ripley to kill him. Brett on the other hand is barely recognisable: he's metamorphosing into an egg which would have been the way the beast was able to procreate. If that scene had stayed in, the rest of the franchise have had to accommodate an entirely different lifecycle for the beast. Which would have meant no queen. Part of the reason why Alien 3's penal colony has no firearms is down to Weaver, who after working on the gun-heavy Aliens insisted that all traces of guns be removed from the script. One aspect she was fine with was Ripley's hairless dome, shaving her head several times a week during the main shoot to keep it consistent for continuity purposes. When production geared up in Los Angeles after a lengthy hiatus, she was reluctant to remove her peach fuzz unless an additional chunk was added to her salary. The props department created a bald cap. 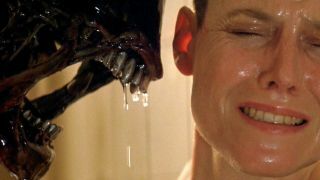 Of the numerous scenes Cameron trimmed from Aliens, the one Weaver fought to keep in was when Burke breaks the news that Amanda Ripley, her daughter had died. We've got to agree with Weaver on this one, as this goes someway to explaining why Ripley is so hellbent on rescuing Newt. Bonus sub-trivia: The woman in the picture is Sigourney Weaver's actual mum, Elizabeth Inglis. Screenwriters Vincent Ward and John Fasano's untapped work on Alien 3 is perhaps the most well-known. Set on a wooden monastery satellite planet called Arceron, their script was populated by an order of monks who had rejected all forms of modern technology. As producer David Giler pointed out later, they could never explain how the wood got there and why it hadn't rotted. Additional technical errors involved an oxygen sac surrounding the planet, allowing the monks to spot Ripley's descending escape pod. Ward and Fasano were just two of the many screenwriters who tackled earlier drafts. William Gibson's 1987 screenplay involved Hicks and Bishop battling xenomorphs on a space station, while Eric Red's scuppered all survivors and brought in a new character to battle the beasts. Creating the opening sequence on Alien 3 Alec Gillis and Tom Woodruff required a prosthetic cast of Weaver's head to depict the facehugger affixed to her face. Without one readily available they secured a replacement from the Fox archives: taken of Meryl Streep during production on Death Becomes Her. And that's not her only brush with the series; Streep was scheduled to audition for the role of Ripley but had to pull out at the last minute. David Fincher fought with Fox for control of Alien 3, a battle he eventually lost, giving up the final cut to studio bosses. The theatrical print released - and widely-considered canon - is a mere hint at what he had planned. On the Alien anthology release, the assembly cut edited by boxset producer Charles de Lauzirika from Fincher's notes presents a completely different film, as opposed to the standard director's cut. An entire subplot excised from the main version has Ripley and the convicts successfully trap the beast, only for Golic, who is curiously absent from the theatrical cut from this point on, to set it free. That's the tip of the iceberg. Additional scenes include a different host for the beast, an ox named Babe.